My olive-aficionado sister is coming for a visit and I have been planning to make this loaf for her. This recipe is actually a variation of a sourdough raisin bread in the book. 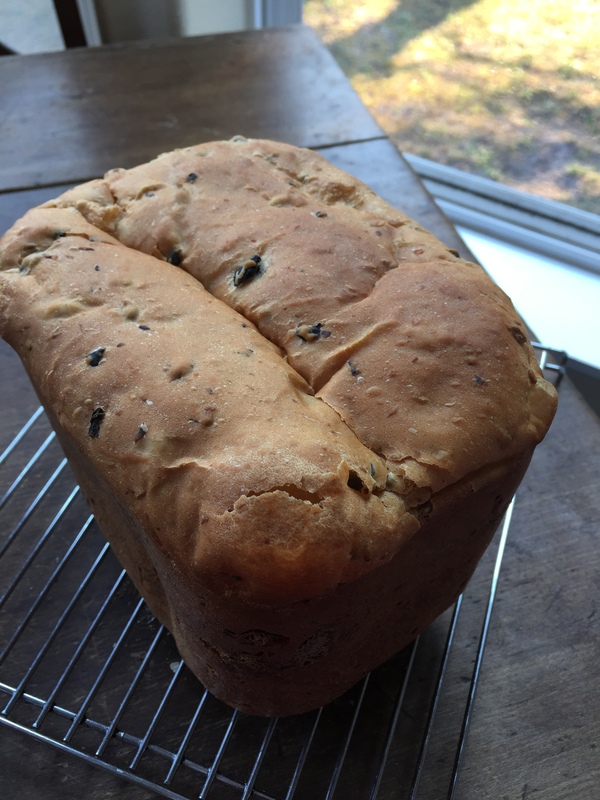 The author writes that by reducing the salt and replacing the raisins with a mixture of black and green olives you can easily adjust this loaf. Yesterday, I took 1/2 cup of my sourdough starter from the fridge. To that, I added 3 cups each of water and flour in a ceramic bowl, mixing with my dough whisk. I then covered the resultant sponge and waited until it was fully active again. (This took about 15 hours.) I also added another cup each of water and flour to my stored starter and put it back in the refrigerator. When the sourdough sponge was ready, I first had to prepare the canned olives. I halved 1 1/4 cups pitted black olives and 1/2 cup pitted, pimento-stuffed, green olives. I then drained these for about 30 minutes on paper towels. Into the pan on my bread machine, I placed 1/2 cup of my sourdough sponge, 3/4 teaspoon salt, 1/2 cup fat free milk, 2 eggs, 2 tablespoons of butter (cut into pieces,) 3 cups of bread flour, 2 tablespoons sugar and 1 teaspoon SAF yeast. I programmed the bread machine for a basic loaf with a dark crust and pressed start. When knead 2 began, I gradually added in the pitted, halved and drained olives while the machine was kneading. It was taking a while for the olives to be incorporated into the dough, so I used a rubber spatula to help it along. Due to residual moisture in the olives, the dough was looking sticky, so I added another 3 tablespoons of flour while everything was kneading together. As I have learned, sourdough breads are sometimes slower to rise, so I checked the bread machine just before the bake cycle was to begin. I decided the bread needed more rise time, so I unplugged the machine before it could start baking and allowed the rise to continue for another hour. At that point, the dough ball was risen perfectly, so I plugged the machine back in and started the “bake only” cycle. When the cycle completed, I transferred the loaf to a rack to cool completely before wrapping it up to send it home with Becky. I will be sure to let you know what she thinks. NOTE: If you are interested in the original, Sourdough Raisin recipe, the following needs to be changed. Increase the salt to 1 1/2 teaspoons and replace the olives with 1 1/2 cups raisins that have been soaked in hot water for 1 1/2 hours at room temperature and then drained well on paper towels. I got word from Becky today on how the taste test went for this loaf. Sounds like this is another keeper.